Hallux Valgus is very common among female. One may think the cause of it may solely related to wearing high heel shoes. However, majority of the sufferers seldom wear high heels and men can also develop the same symptoms. Therefore, the underlying causes are far more complicated. The joint between the big toe (proximal phalange) and the foot (metatarsal bone) is called 1st metatarsal-phalangeal joint (1st MTPJ). The head of the 1st metatarsal bone is twice the size of the 2nd metatarsal so that it is a major weight bearing area of the foot. There are two small sesamoid bones help the weight bearing and act as pulley systems to increase the mechanical advantage of the plantar muscles. The 1st MTPJ is not a simple hinge joint. The metatarsal has to slide downward before the big toe can bend upward because of the structure of the articular surface. Anything hinders the functions of the 1st MTPJ could cause degenerative changes to the joint. Excessive foot pronation is one of the main risk factors. 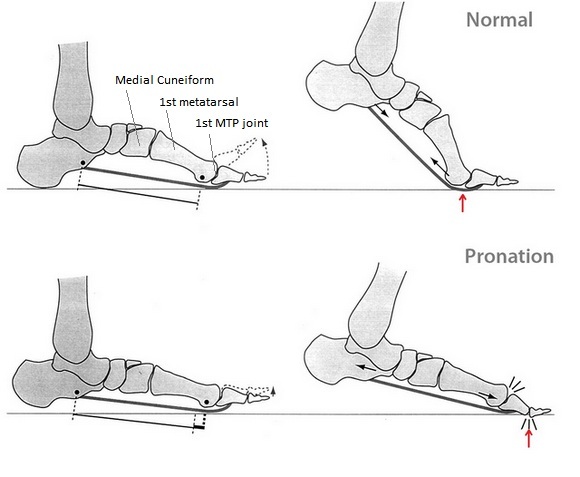 Pronation causes collapse of the foot arch, thus　shifting the plantar pressure to the inner side of the foot and tighten up the plantar fascia that connects the toes to the heel. This extra tension could hinder the upward bending of the big toe during the gait, resulting in functional hallux limitus. Functional hallux limitus shift the weight bearing area from the head of 1st metatarsal bone to nearly the tip of the big toe. It thus generates a strong torgue at the 1st MTPJ that would bend the big toe towards the 2nd toe, leading to hallux valgus. 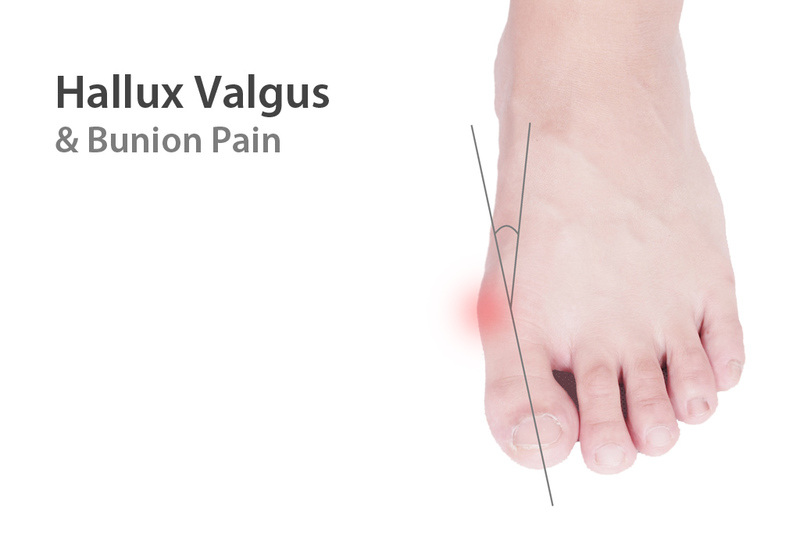 Treatment options depends on the severity of the hallux valgus. It is divided into 4 stages. Stage 1 is reversible. if the hallux valgus is within 15 degree　stretching exercise (by HV splint) and controlling the risk factors (e.g. foot pronation, high heels) are effective. Stage 2 is irreversible. Stretching exercise and controlling risk factors are essensial. However, the angle of hallux valgus cannot be reduced. Stage 3 is deteriorating. X-ray shows the subluxation of the sesamoid bones. All the means of treatments cannot stop the deterioration of the hallux valgus. They can only slow down the process, but it is still worth to do so. Stage 4 is the final stage of the hallux valgus. Usually the 2nd toe is affected as the functions of the big toe are lost and shared by the 2nd toe, which is a much smaller toe that is not designed to be work heavily. The big toe may cross with the 2nd toe and surgical options have to be considered to restore the function and structure of the 1st and 2nd MTPJ. Sucessful surgery can reduce the angle of hallux valgus, but post-surgical protection is essential. The hallux valgus will bounce back because the risk factors are not treated in the surgery and still affect the functions of the MTPJ. 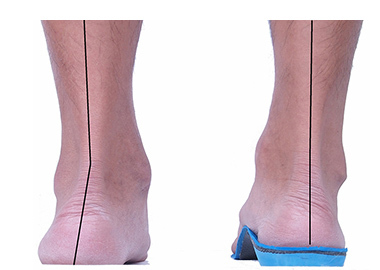 Biomechanics Inosles helps to reduce excessive foot pronation (arch collapse) and thus prevent the functional hallux limitus, fascillitating the normal bending of the big toe and minimize the risk of degenerative change of the MTPJ.